Here’s Wight Spirit, an Evolution 38S, bigger, faster and cleaner, smoke free and ready to go. 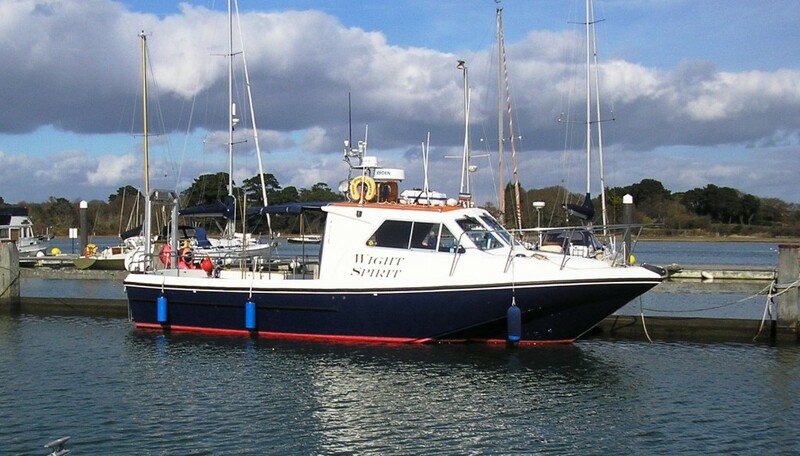 The new dive boat Wight Spirit is an Evolution 38S, operating from Lymington. She is powered by an 8.3 litre, 500 horsepower turbo charged engine. Normal cruising speed when loaded is around 15 knots. 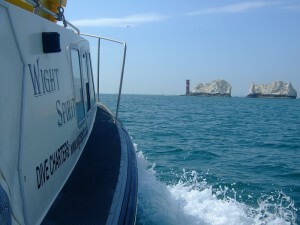 Wight Spirit is licensed for 12 persons plus 2 crew. She is equipped with all safety gear, from first aid kit to 4 + 12 man liferaft. She is licensed under the MCA Code of Practice category 2 (60 miles from a safe haven) and fully insured. She is well equipped with modern electronics, including 2 radar, 2 VHF radios and GMDSS, 2 colour echo sounders, DGPS and GPS, 2 colour chart plotters, 2 AIS systems, Navtex for up to the minute weather reports, magnetometer, cooler, cooker and cabin heaters. 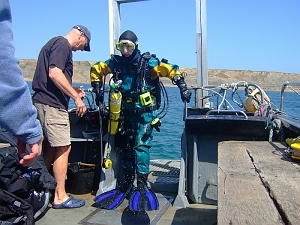 Optimum deck space is available through the provision of stainless steel benches with teak decking, upon which divers sit and kit up, with space beneath for bags and boxes. Additional storage space and benches are fitted on the engine cover. 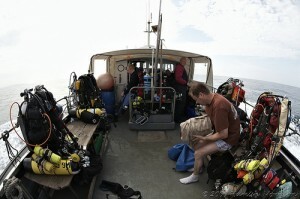 The bench arrangements mean that 12 divers can be fully kitted and seated all at the same time. Sitting space for passengers in shelter under a large canopy is available outside the wheelhouse, while the wheelhouse itself can sit 8 or maybe 9 at a push. It means evryone can be in shelter on the way to and from the dive site. Dry bags are stowed in the wheelhouse or forepeak. Overnight storage for wet gear is provided in two large hatches at the stern. An electric lift is fitted on a gantry at the stern. Entry to the water is through the removable transom door – just walk through and enter the water feet first! Recovery is safe and simple even when the sea conditions are less than ideal. Just stand on the platform which will be lowered to four feet below the surface, hold on to the hand rails and you’ll be winched up to deck level. Walk into the boat and sit on one of the benches to de-kit. Usually, assistance will be given until you are seated. Other features include a floating lifeline which runs at water level from bow to stern – useful to guide youself to the stern lift and a rope with stainless steel ring and clip if you want to take kit off in the water – I’ll lift it inboard. The toilet is fitted in the wheelhouse. A folder is openly available in the wheelhouse, detailing most of the wrecks, together with photographs and their circumstances of loss. 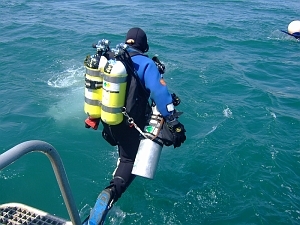 A 24 litre cylinder of medical oxygen is kept on board and is sufficient to support a maximum of 4 divers at the same time (2 on demand valves and 2 on oxygen masks – I know it works as I’ve had 3 divers on it together). There is no charge if it is necessary to use oxygen – if I think you may be affected by decompression sickness, it’s the best treatment I can give you. I’ll notify the Coastguard and discuss the situation with the diving doctor, and if it’s necessary you’ll be lifted of by helicopter. If it turns out you haven’t got decompression sickness, no harm is done. Finally, there are ample supplies of tea and coffee. Oh, almost forgot – I keep a supply of lead weights, spare hoses, O rings etc, for those last minute glitches which occur from time to time. It means the difference between getting in the water and not diving at all. 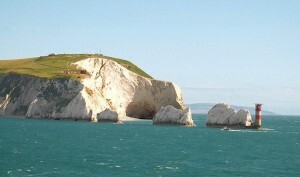 Approaching the Needles from the south east, 2. the Needles and Sun Corner.